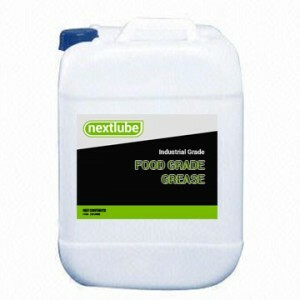 FOOD GRADE GREASE is a white, non-toxic, USDA H1 grease for the lubrication of machinery used to produce, process, package and/or transport food, beverage and pharmaceuticals where incidental contact with product may occur. All the components in FOOD GRADE GREASE are in accordance with U.S. Food and Drug Administration regulation 21 CFR 178.3570, and is authorized for use as a lubricant with incidental food contact by the USDA for use in official establishments operating under the Federal Meat and Poultry products inspection program. The USDA inspects the Meat and Poultry processing industries. Other industries adhering to USDA regulations include: Beverage plants, Breweries, Canneries (fruit, vegetables, seafood), Sugar and Confectionery products, Grain products, Bakeries, Fats and Oils, Pharmaceuticals, Cosmetics, Personal Care and Pet Food Product. FOOD GRADE GREASE is a heavy duty grease manufactured using a blend of highly-refined, high purity USP white mineral oil thickened with an aluminum complex soap gel system produced by a state-of-the-art manufacturing and homogenizing process. Food handling equipment is particularly difficult to properly lubricate because of the restriction on the type and quantity of ingredients that can be used in a food grade formulation. FOOD GRADE GREASE solves this problem!